Litigation Support and Summer Showcasing - Precise, Inc.
Precise’s involvement with attorney organizations allows us to showcase our latest jury research, eDiscovery, and trial technology solutions while supporting the smartest legal minds in the area. We love learning more about what the attorneys are working on and what challenges they are facing so we know how to we may continue to help them prevail. Cody Roberts, Esq. talks to a guest at the PDI conference at Bedford Springs Resort. 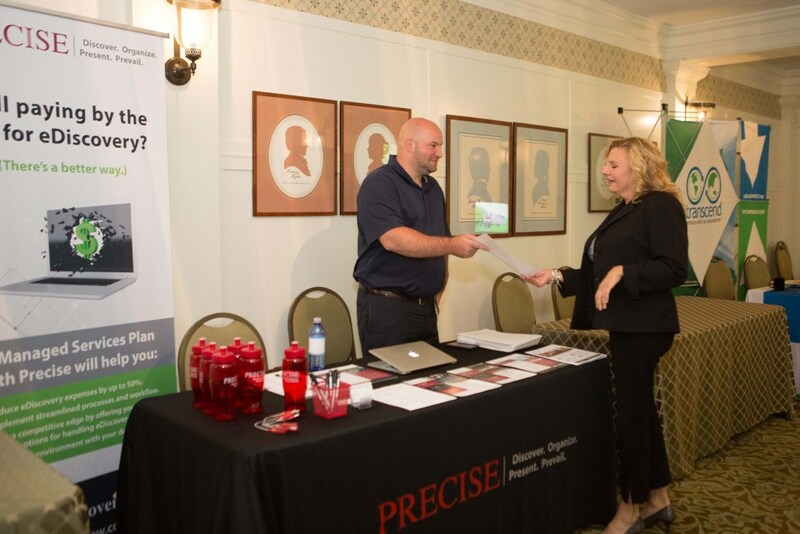 This summer, Precise was fortunate to support the annual convention for the Delaware Trial Lawyer’s Association in Rehoboth Beach, DE, the Pennsylvania Association for Justice Annual Retreat at Nemacolin Woodlands Resort, and the Pennsylvania Defense Institute Annual Conference at Bedford Springs Resort. Notably, the PAJ and PDI are both celebrating their 50th year! The chance to catch up with attorneys and other legal professionals in a relaxed and enjoyable setting, away from the hyper-focused atmosphere surrounding a trial deadline is one we value tremendously.